See more objects with the tag women's fashion accessories, collapsible, cooling, geometric, handheld. See more objects with the color gainsboro tan grey darkolivegreen dimgrey or see all the colors for this object. 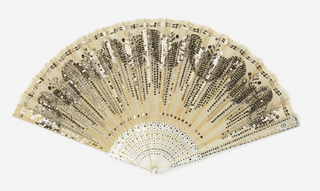 This is a Pleated fan and case. It was distributed by Tiffany and Co.. 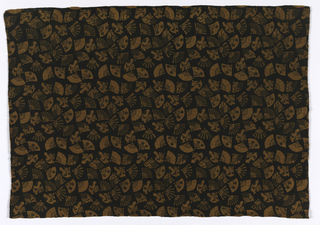 It is dated 1910–1920 and we acquired it in 1952. Its medium is silk leaf embroidered with steel sequins, mother-of-pearl sticks with steel piqués, mother-of-pearl washer. It is a part of the Textiles department. 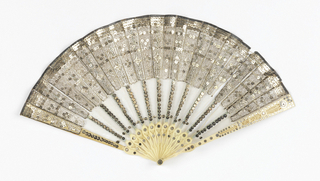 This glittering fan is a beautiful example of the fashion for spangled fans in the first two decades of the twentieth century. 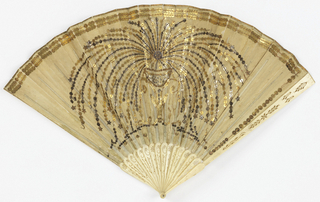 Sequins and spangles were popular embellishments at various times in the history of fan design, particularly in the last quarter of the 18th century, the early 19th century, and then again in the first quarter of the 20th century. 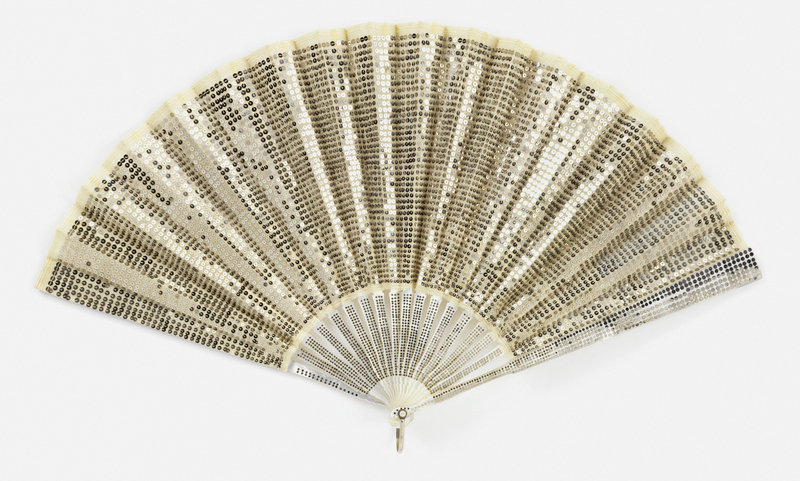 The entire surface of the silk leaf and the mother-of-pearl sticks of this fan are covered with carefully aligned steel spangles, creating a graphic and modern textural effect. The placement of the spangles is precisely engineered so that the fan can be closed without interference from the spangles. 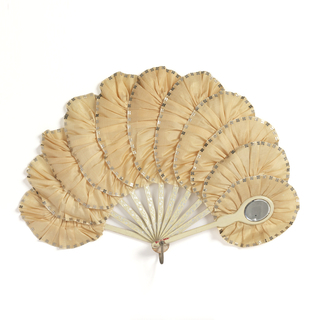 Accessioned with this fan is its original white satin storage case marked, “Tiffany & Co”. 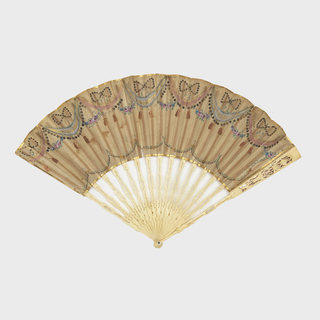 During the late 19th and early 20th centuries, Tiffany and other luxury stores in the United States sold high quality folding fans to meet customer demand. silk leaf embroidered with gold and silver sequins; pierced ivory sticks. silk leaf with sequins, silvered wood sticks with mirror.